Take Current Affairs quiz March 8, 2019 to enhance your General Awareness. Practice with our esteemed Current Affairs quiz March 8, 2019 questions which covers all important events across India as well as World. 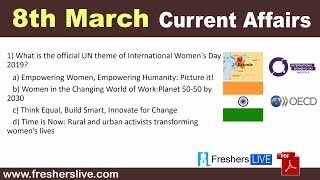 Make use of all important Current Affairs quiz March 8, 2019 questions with answers updated here, at free of cost to succeed in all competitive Exams and Interviews. Which of the following amended rule will completely ban the import of solid plastic waste? The Ministry of Environment, Forests and Climate Change (MoEFCC) has amended the Hazardous and other Wastes (Management and Transboundary Movement) Rules, 2016 to completely ban the import of solid plastic waste. Organisation for Economic Co-operation and Development (OECD) has reduced the world economic growth forecasts for the year 2019 from 3.5% to ________. The Organisation for Economic Co-operation and Development (OECD) has reduced the world economic growth forecasts for the year 2019. OECD has cut its 2019 forecast for global economic growth to 3.3% for the current year, down from 3.5% it predicted earlier. For which of the defence wing did the Cabinet approve permanent commission for Women? The Defence Ministry announced that permanent commission will be granted for Women in all the 10 branches of Indian Army. The mission PM-STIAC is to ensure India's sustainable development. What does PM-STIAC stand for? The Prime Minister's Science, Technology and Innovation Council (PM-STIAC) has identified nine national missions to address major scientific challenges to ensure India's sustainable development. Who conferred The Women on A Mission Award at the Women's summit? Brandix India Apparel City (BIAC) India’s partner P. Doraswamy was conferred with ‘The Women on A Mission Award’. Which state government launches app One Delhi to track bus, metro services? Delhi state government launches app One Delhi to track bus, metro services. State Bank of India and and Hitachi Payment Services launched SBI PSPL to establish digital payments platform in India. National Housing Bank proposes stricter regulations for Housing Finance Companies. Which country will invest Rs 5,000 crore in Bharti Airtel? Singapore's government’s investment arm GIC Pvt Ltd will subscribe to shares worth ₹5,000 crore as part of Airtel's plans to raise ₹25,000 crore through rights issue. According to the Price comparison site Cable.co.uk, which country offers world’s cheapest mobile data packs? According to a new report Price comparison site Cable.co.uk, India is home to the cheapest mobile data plans in the world, with one gigabyte (1GB) of data costing an average of $0.26, compared to USD 6.66 in the UK. Kaja Kallas has been elected as the first female Prime Minister of __________. Kaja Kallas was appointed as first female Prime Minister of Estonia. She is the leader of country’s Reform Party. How much would World Bank grant for a healthcare project to Andhra Pradesh? World Bank grant for a healthcare project to Andhra Pradesh around 2,200 crores. Government will introduce new Rs 20 coins shaped like a ________. The Finance Ministry has announced the rollout of a new ₹20 coin shaped like a "dodecagon", a 12-edged polygon. The new coin will be heavier than all the existing coins at 8.54 grams. What is the official UN theme of International Women's Day 2019? A.Empowering Women, Empowering Humanity: Picture it! The Official UN Theme of International Women's Day 2019 is Think Equal, Build Smart, Innovate for Change. Are you looking for right place to enhance your Knowledge on Current Affairs of 8th March 2019 through effective Quiz section? FreshersLive grants you the advantageous Current Affairs Quiz questions with accurate answers for 8th March 2019 which covers all the important events, supreme Awards, major occurrences in the National as well as World level. All important Current Affairs Quiz questions of 8th March 2019 are updated instantly in this page. Everyday at least 25+ Current Affairs Quiz Questions are displayed in this FreshersLive page. Correct Answer for each quiz question is given at the end of the entire 8th March 2019 Current Affairs Quiz questions section. You can estimate and upgrade your GK by attending these useful quiz questions. Entire quiz questions of 8th March 2019 Current Affairs covers Competitive Exam as well as Interview point of essentially important topics like International News, National News (ie. Indian Affairs), Science & Technology News, Environmental News, Bills & Acts Passed by Government, Defence News, About important Persons, Places, Banking & Economical News, Awards & Honours, Sports News, Revolutionary Updates on Arts & Culture, Obituary, Summits & Conference, Important Committee, Schemes, Appointments, Important Days & its Theme for Current as well as upcoming Year, Books & Its Authors, Agreements & MoUs, Budget, Taxes, Various Important Lists & Indexes, Visits by World Presidents, Prime Ministers, Political affairs and all Current Events. 8th March 2019 Current Affairs Quiz Questions updated in this page are prepared in the sense to help all aspirants to succeed in various Competitive Exams like UPSC IAS and other Civil Services Examination, Various Bank exams like IBPS PO, IBPS Clerk, SBI PO, SBI Clerk, RRB PO, RRB Assistant, Insurance exams like LIC AAO, UIIC Assistant, Railway Exams, Various Central Government Exams like SSC CGL, SSC CHSL, and more. Attempt all the Current Affairs Quiz Questions of 8th March 2019 and evaluate your score by matching your response with the correct answers mentioned at the end of this quiz questions section. By practising the FreshersLive Current Affairs Quiz Questions on a daily basis, you can surely succeed in the competitive exams as well as the interviews easily. Make use of this ultimate resource to the fullest and quickly achieve your goal!